No one really expected the Cards to just run the table on the Giants. Especially with the charge in the air from those crazy-loud fans at AT&T Park (did I mention they’re LOUD?!). Tonight was just not the Birds’ night. Matt Holliday barreled into Marco Scutaro to break up a double play in the first inning. When I say “barreled into,” I mean linebacker style. It was a HARD slide. And a little late. 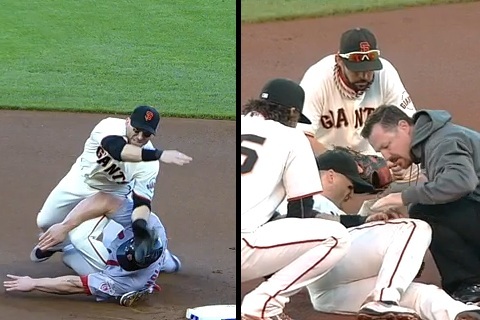 (I still think he stumbled or tripped a little as he started to slide — well ahead of the base — and that threw him into Scutaro harder than intended, but that’s beside the point.) Scutaro eventually left the game and had x-rays taken on his left hip (which were negative, by the way). It was the kind of play that caused everyone to start thinking about what the retaliation would be. The kind of play that sparks a team to rally. The Cards failed to score that inning, Angel Pagan led off with a home run off Chris Carpenter. And, though the Cardinals did tie it at one in the second, it didn’t get much better from there. Carpenter was done after four innings. Kelly pitched one, Salas one, Miller 1 1/3 (more on that inning tomorrow, I’m sure! ), and Rzepczynski finished off the 8th. Meanwhile, Ryan Vogelsong was very good. Too good for the Cardinals bats that have gone a little silent once again. Missed opportunities, costly defensive miscues, and yes, a few (very) rough moments for the umpires later, and the Cards drop game two 7-1. Let’s hope all the sloppiness is out of their system and they can head home to sweet St. Louis, take the off-day to regroup, and get right back on track!